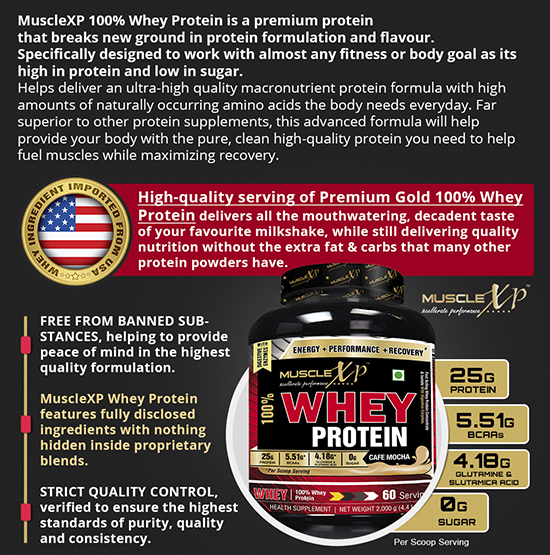 MuscleXP 100% Whey Protein is devoid of banned ingredients, offering its consumers with peace of mind regarding its superior quality formulation. The researchers of this product have come up with an enhanced whey protein formula which does not just aid with quick muscle-fuelling outcomes, but its flavour has a gratifying, scrumptious, lip-smacking taste. Every serving can be mixed straight away with a blender, shaker, or a spoon – which indicates its smooth texture. What is Whey? How is it useful? A number of top athletes ensure that Whey Protein remains their first choice for post-workout recovery. MuscleXP 100% Whey Protein can be called an all-inclusive protein, which means that it offers the entire array of Essential Amino Acids. They can be included in a diet, and are digested quickly to aid in the recovery procedure  .MuscleXP 100% Whey Protein is an all-whey concentrate merged with Pure Whey Protein Isolate. Why Use MuscleXP 100% Whey Protein – 2Kg (4.4 lbs) Cafe Mocha With Digestive Enzymes? Quick-working whey protein isolate is the frontrunner as far as protein is concerned. It has been formulated according to the New Gold Standards – 121 kcal Energy, a total of 25g Protein, along with 0.83g Fat, 0g Sugar, 0g Trans Fat for every 33g Serving. Elevated protein amount (25 g of protein per serving). Fortified with Sodium and Potassium, along with Calcium and Phosphorus. Contains superior coffee particles that have been blended for a smooth and delicious taste. Lip-smacking Double Chocolate Flavour. Ready to consume when mixed with the help of a spoon. Produced in compliance with World Class International Manufacturing Standards NSF-GMP, ISO 22000, and is OHSAS 18001 & ISO 14001 certified. 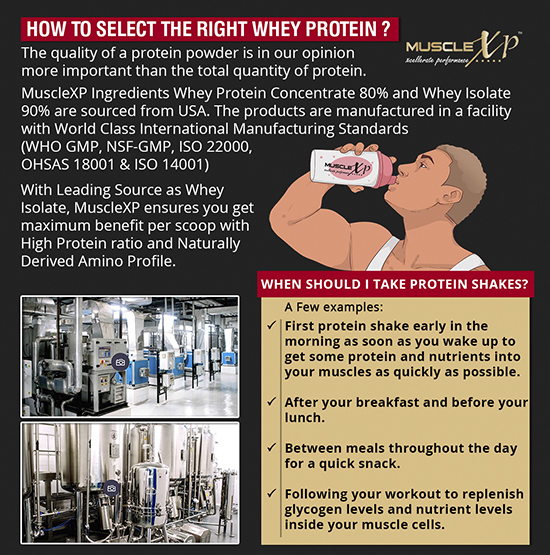 MuscleXP 100% Whey Protein could be used not just as protein shake. By including fresh or frozen fruit pieces, peanut butter, olive oil, coconut or any other high energy ingredient, it is possible to transform this shake into a lip-smacking high-protein feast. Try blending a scoop of this product with oatmeal, yogurt, or the regular amount of milk that is poured over daily breakfast cereal. Contains Ultra-Filtered Whey for reduced cholesterol, fat and sodium. MuscleXP 100% Whey Protein contains Whey Protein Concentrate 80%, Whey Protein Isolate, Caramel, Amylase, Papain, CONTAINS ADDED NATURE IDENTICAL FLAVOURING SUBSTANCES (COFFEE). CONTAINS ADDED ARTIFICIAL SWEETNER (INS 955). A top quality product. This is pure whey protein. Whenever I take it, I feel full and energized. This whey protein tastes great and is also easy to digest. I feel energized. I love the taste of this whey protein shake. The quality of the product is good. There was no digestive issue. Feeling healthy and energetic. Because of its exciting flavor, I love taking this whey protein shake. It is one of the finest quality whey proteins. This is premium quality whey protein. Tastes awesome. This high protein product is easy to digest. For healthy weight gain, I am taking this protein rich high calorie product. It didn’t cause stomach distention or digestion difficulties. Tastes wonderful! This mass gainer is supporting healthy weight gain. I am gaining muscle mass and not the unhealthy fat. Like the taste. I love this whey protein. It tastes just like my favorite beverage. Didn’t experience any digestion issues after taking the protein rich drink. Whey protein is an important component of my diet. It is helping in maintaining muscle mass. I love the flavor. This is the high quality whey protein with a fabulous taste. It is one of my favorite protein drinks. This is natural whey protein. It mixes well. It has an excellent taste. I recently started taking whey protein. It blends easily and is easy to digest. It tastes good. I like this whey protein because it is working for me and is easy to digest. I feel energized when I drink a cup of warm protein shake. Like the flavor. This is easily digestible pure whey protein. Blends easily and tastes good. This whey protein tastes good. It is easy to digest. Excellent quality whey protein. The cafe mocha flavor makes it delectable. It is easy to digest. This whey protein is excellent. Great quality and taste. It has a smooth texture and blends well. This is pure whey protein. It tastes good. It is easy to digest. I prefer this whey protein because apart from its excellent quality and taste, it is easy to digest. It meets my body’s protein demand for muscle growth. I’m taking this whey protein for a couple of months. It is of the best quality. It makes me feel full and is perfect for maintaining muscle mass. This is definitely the best quality whey protein. Unlike a number of other protein powders, I found this easy to digest. Nice taste. The cafe mocha flavor tastes good. The whey protein is of good quality. It keeps me full and energized. The digestive enzymes ease digesting the protein rich drink. Top grade protein product. Great taste. Blends well. This is good quality protein. Great taste. I usually use it for making yummy smoothies. It energizes and helps in maintaining muscles. I like the taste. Superb quality whey protein. It didn’t cause any digestion issues. The quality of the whey product is really good. It provides me energy and is good for maintaining muscles. Tastes good. The best quality whey protein for muscles. It energizes me and quickly makes me feel full. It is easy to digest. Blends well. Very good tasting whey protein. The perfect protein for keeping me energized during my workout session and maintaining muscles. Great tasting whey protein shake. I take this usually after workouts. This makes delicious protein shakes. This is providing me additional high quality protein for maintaining muscle mass. The cafe mocha flavour has made this whey protein shake my favourite protein drink. Good quality, it is at par with the international standard. Fast acting protein shake. Tastes good. Easy to digest. Whey protein is an excellent source of the muscle-building amino acids. This particular when protein powder is of premium quality. I feel full and energized after taking it. Great taste. The cafe mocha flavour is delicious. The quality of the whey protein is really good. It is perfect for bodybuilders. I’m taking this for a month. I’m getting the additional high quality protein for muscle development from this whey protein powder. It mixes very well and tastes great. The quality of the whey protein is undoubtedly excellent. It is supporting muscle development. This is the whey protein I was looking for. Excellent quality. Easily digestible. Good taste. This whey protein is of the best quality. Works great as post workout drink. Taking whey protein to increase muscle mass. I like the flavor. The protein powder blends easily with water and milk. The perfect protein for increasing muscle mass. It mixes easily with both water and milk, though I prefer taking it with milk because I feel the cafe mocha flavor tastes better. The cafe mocha flavor makes this whey protein powder taste really good. The quality of the protein is excellent. It is a component of my bodybuilding diet. It is helping in building muscles and boosts energy. This is good tasting whey protein powder. I am taking this to increase my protein intake to attain healthy body weight. It is helping. This is a great source of healthy protein. I need extra protein for healthy weight gain, so I chose this particular whey protein. It tastes great. MuscleXP 100% Whey Protein can be made rather quickly. This means if you are without your shaker cup or lack the time to take a blender out, simply add one scoop of MuscleXP 100% Whey Protein to a glass that contains 6-7 oz (200 ml approx) of water, skimmed milk or a beverage of your choice. It can be blended with the help of a spoon. It can be mixed for around 30 seconds or till the powder is entirely dissolved. TIP: To obtain a bolder flavor, blend each scoop with around 5 oz (150 ml) of water, milk or the beverage of your choice. For a milder tasting drink, blend 8-10 oz (275 ml approximately) of base liquid with each scoop. Blending 150g of the whey protein powder with non-fat or skimmed milk in place of water will provide a smoother, tastier, higher-calorie shake. First-time users might start with 75g or protein powder in 13-17 oz (400-500 ml) of liquid once every day in the first week. After this, they can slowly increase the quantity of protein powder as required.